Where To Cut My Orchid After It Is Finished Blooming? My orchid has lost all its flowers. It has 2 very long stems (about 30 in each). Where should I cut it so that it continues to grow tall and gracefully? Here is a photo when it was in full bloom. Isn't it gorgeous? Comments for Where To Cut My Orchid After It Is Finished Blooming? Hi Diana, Thanks for your questions and your BEAUTIFUL picture. I apoligize for not getting to your question sooner. I grow wine grapes in Northern California and it is harvest here. So, very busy on my end. Your question was: Where should I cut it so that it continues to grow tall and gracefully? You have two choices if the flower stems are still viable now. You can either cut it about 2 centimeters from the crown of the plant, essentially cutting them off entirely. This will mean that the plant will need to initiate a spike on its own. When it does, you would need to carefully stake it as it grows to help it grow tall and not break from the weight when it gets large. The other choice that you have if the stems are viable and the plant is healthy is to cut it about a centimeter above a node on the stem. Most of the time the plant will push another spike from that node. So you would want to pick one that would add to the grace of the plant when it pushes, if you understand me. This spike would also eventually need to be gently staked to support the blooms that will form. 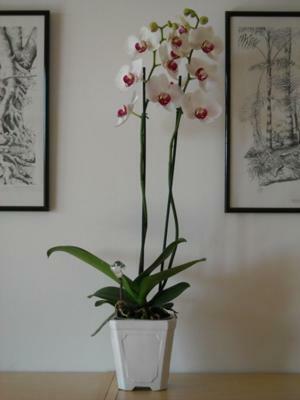 Yours is a really beautiful Phalaenopsis. Thanks so much for sharing your picture.